Today Bernardo Kastrup returns to the salon with more metaphysical speculations. Supplementing his recently released book, “Brief Peeks Beyond,” he touches on the so-called hard problem of consciousness faced by materialists. In his examination of the dominant materialistic world view, Bernardo reveals the forces behind our value systems, which in turn determine our behavior. He ends with some very concrete suggestions for five things each of us can do to make the world a little better. However, my favorite section of this talk comes when he suggests that cosmic consciousness at-large may actually be experiencing what we humans call multiple personality disorder. Posted in Bernardo Kastrup, Books, Consciousness, Culture, Death, Future, Occupy, Science & Technology. how does a materialist feel about lucid dreams? The only thing that is for sure, is awareness. which is self evident by being aware. All the content that is perceived through the (dream)persona, can not said to be existing. It’s just insane to believe that the content exist without the perceiver, and even more so to assume that the content is responsible for awareness. I’m listening to this lecture right now. Struck me the people on this thread might like it too. “My quibble with panpsychism is that it subtly, though definitively, frames consciousness as subordinate to matter. Even while granting consciousness to be a fundamental property, it does so by saying that it is a property _of_ matter. In other words, matter still exists outside consciousness and happens to fundamentally have consciousness. Matter _has_ consciousness, under panpsychism. “Idealism, on the other hand, is very different: it states that matter appears in consciousness as percepts, and does not exist outside consciousness. Consciousness isn’t a property of matter, but matter an excitation of consciousness. Consciousness is the ground of existence, not matter. That said, these views are indeed very old; older than the pre-Hellenistic period you mention. They go back to the Vedas of ancient India. I am not claiming originality of essence here. At best, I am giving these ideas a modern context through the use of updated metaphors and language, without the religious baggage. You say that we don’t see the communication taking place across different parts of the universe, like we see it taking place across neurons in the brain. But is this really so? If you were a microscopic little person inside a mitochondria in a neuron, would you see inter-neural communication? Scale matters here, as well as the kinds of signals we are able to detect with present-day technology. Can you see the electromagnetic waves going into your computer to allow you to see this message? 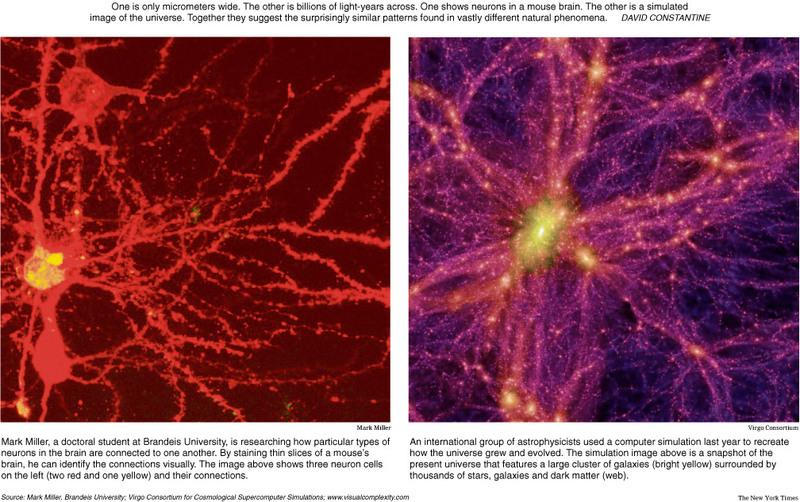 The connecting structures linking galaxy clusters together are supposedly made of dark matter, whose nature nobody understands today. What kind of signals may be going through dark matter? And what kinds of signals may exist that our technology isn’t able to detect? All this said, there are even signals we know of that are certainly going across all structures of the universe: light, gravity waves, etc. In conclusion, we don’t know that there is no communication, at a universal level, analogous to what happens in brains. As the study I linked above suggests, the opposite is what the evidence seems to be indicating. When you talk of lower-dimensional projections of consciousness, you may be saying the same thing I mean with something being the ‘external image’ of a mental process. What is a lower-dimensional projection but the partial image of something? A shadow is a lower-dimensional projection of a person and a partial image of a person. The reason I prefer to avoid the word ‘projection’ is that it evokes substance dualism, like body and shadow. I try to stay consistent with the notion that there is *only* consciousness. As such, there is no such thing as a differentiation between consciousness and its ‘mechanisms.’ Whatever ‘mechanisms’ we see are just outside images of processes in consciousness. This was interesting and certainly not something I would entirely disagree with. But I am struggling to interpret the central claim, namely that the universe is a second person view of the mental experience of God in the same way as biochemical activity in the brain, rendered available to the senses of a third party using machinery able to detect such activity, is a second person view of the subjective mental experience of the individual. Hoping I have correctly stated the claim, is there not a rather obvious non-parallelism, insofar as the former is observed as system whereas the latter is observed as activity within the system? In the universe it is not obvious to me that we see the activation of elements of the system and the equivalent of neural pathways between them. That is, the communicative activity observed in the case of the brain is not observed in the case of the universe, at least at the cosmic level. It is also questionable to me whether the image of the functioning of the brain is really a second person view of individual consciousness. They are certainly related, but not necessarily isomorphic. I would rather see brain activity as a projection of consciousness into a lower-dimensional space. This allows for the possibility that other sense objects are also projections of consciousness, whether individual or collective, such as art, but also the whole social and material world. However, this is a more minor point as I don’t think Bernardo’s argument depends on their being an isomorphism between the two points of view, nor perhaps is he even claiming this. Bernardo, if you are still on the thread, could you perhaps clarify whether you consider that in observing the universe we observe the activity of mind at large, or merely its machinery, and if the latter, why nevertheless the analogy with the brain holds? Ahhh, Chris, it hurts when one puts a finger in the wound by saying the truth, doesn’t it? 🙂 Your brief message requires no reply, since it speaks loudly for itself. Darren, Glum, Jordan, Joaquin, thank you guys! I canwget behind all this woo woo materialism bashing. They just build a strawman and make sweeping unbacked generalizations. Deepak and anyone having anything to do with him is suspect in my eyes. These guys are just waving around pseudoscience mumbojumbo. Thanks to Lorenzo and especially Bernardo for expressing his enlightened views of a much deeper reality. I think that Bernardo is the new Terence Mckenna and I’m sure that Terence would wholly agree were he still alive today. However, I’m somewhat skeptical of the positive changes occurring any time soon as the vested interests in maintaining the status quo will simply appeal to people’s selfishness and potential greed in order to carry on business as usual. I believe too many people have too much skin in the game for things to change at the pace which is needed. As a species, we have very little time left for making the critical improvements that will change our direction. We can only do our best at the individual level and hope that others will follow our modelling. Even if the majority pulled out of the material game overnight, the whole economic system would collapse and the fallout would be truly devastating for most I believe. It’s a kind of catch 22 that we are involved in. Just how we make the transition in the time needed without this happening I am lost for a solution. Personally, I am practicing Vipassana meditation in the hope that my flow of consciousness will eventually be free from the maddening cycle of birth, death and re-birth. My practice helps me to live a simple life here and now with “the felt presence of immediate experience”, and helping others in positive ways wherever I can. Thanks once again Bernardo, your articulation of what underlies the shallowness of the intellect. It gives me reason to continue on my path. May you and all others find the liberation you seek. Cheers, Darren. May you never starve, Lorenzo, and bless your heart, you seem to be making my point here. It’s been a polemic our whole lives. It isn’t improving, and there are good reasons on both sides that explain it. The Dalai Lama eats meat. He becomes too ill if he does not. Many, many, many people have the same problem. Thankfully, many people do not and can avoid meat for life, or until civilization breaks down, whichever comes first. But, truly, it is not as simple as mere taste keeping the whole world from doing the “right” thing here, or mere obliviousness to ethics keeping people doing the “wrong” thing here. I think it is fundamentally unjust to place value judgments on what is easily shown to be biological imperative, and I think people leap to the defensive whenever the justice of their values seem to be called into question. Besides, it immortally turns into mere politics of lifestyle divide and rule malarkey, despite our best efforts to resolve it. You and I have both lived in it our whole lives. I’m trying to make the point that it is when people get the spiritual insight that materialists deny that we become grownup enough to make these ethical decisions for ourselves, and we DO. You are proof of that. What’s needed is the spiritual insight itself, the ability to make these decisions for ourselves, not to be joining lifestyle factions, but to be truly AWAKENING, each doing our best for all living things. Well, call me a sixties relic, but it has been shown that plants experience fear, whether we regard their lack of an identifiable nervous system as overriding that or not. And fungi live off the death of other living things… and sometimes they even cause it. I’m heavily against materialism, especially now that it’s been taken to a ridiculous extreme by the adherents of scientism, but there’s a bottom line we ignore at our peril, and I think we’re giving people the excuse to roll their eyes and dismiss us by bringing up what we eat, etc. That’s all been on one side of the raging polemic for many decades. Doesn’t work. Turns people off and we get nowhere. It’s heavily to do with the fact that we all EAT and need to keep eating and keep consuming too much in the way of other resources just to keep ourselves off the streets these days. Bringing that stuff up pretty much guarantees MOST people won’t heed, even if our delivery is mild and reasonable. Whereas, making all the beautiful points about the real nature of the cosmos — by itself — seems to me to be the ticket. Quoth Einstein: Truth makes music. We make that music, without dipping back down into the polemical and people will naturally want to become more careful with their consumption. So. I don’t like being the wet rag, but I think this is an important point. Maybe it’s too late to change the book, but maybe in the future, so that people will HEAR, we could stick to enlightening being, stick to the parts that make people WANT to grow up. They’ll naturally act like grownups on their own once they get the kind of information that lets them begin. Amazing talk thank you. Materialism is the blinder of our species…we have been limited for centuries by it.. but it is like everything an experience and one that is necessary for some to have. i believe he also commented on the the torture and inadequate lives of these animals (vegetables, soil biome) we as humans have existed on animals and on vegetables since our begining and have since bastardized our food sources in the name of profits and we ARE all suffering the consequences. Untill i become a light eater ( how cool would that be ) ill chose the least invasive and pervasive practices possible and know that others will aswell once they are aware. What an amazing set of psychedelic memes this talk is filled with! This is a perfect example of what Terence would consider “psychedelic thinking”. Notice how this was accomplished without even talking about entheogens, only briefly mentioning them in pass (also props for quoting the great bard!). I have to admit to having heard of Bernardo first here in the salon, on the previous podcast he provided, and have been a fan ever since. Nines, I think I know where you are coming from, but your statement sort of sounds like an excuse to me. Biology would beg to differ, not all living things live off the death of other living things (see: parasitism, or symbiotic relationships). We also have the case of saprophytic fungi, that as primary decomposers, they feed off decaying organic matter. I’m not arguing that we as humans should look into those types of lifestyles. But if we consider the way plants have evolved, many of them actually benefit from predation as a way of ensuring seed dispersion. It also gets weird when you think about when exactly does plant material die. When you consume broccoli I’d argue that it is still alive (it is metabolizing and in fact consuming its own nutrients to remain alive). We all know the same does not apply to animals. One can also argue that from the point of a cosmic mind, life and death are the same, and so is good and evil, so why choose between either or? However, in our experience as human beings, it is very important to make these distinctions despite being all illusions fundamentally. I’d point out that broccoli does not have a central nervous system and, therefore, the type of stress and pain response a mammal or a bird has. I’d also opine that material consumerism is the main driver behind most of what is wrong in our society today. I do not mean to defend factory farming in ANY way, but I submit that, from the point of view of the cosmic mind, broccoli dies as agonizingly as any cow. There is no way around the fact that all living things live off the death of other living things… save possibly the development of a replicator that makes nutrients out of their constituent atoms. I think this case would be better made without the suggestions about how we might go about making a better world through curbing our consumerism. That’s actually a separate argument.